The signing was done today, December 19, 2017 at the SSB Office, Joshua J. Smith Building, in Road Town, Tortola. According to Premier and Minister of Finance Dr The Honourable D. Orlando Smith (AL), the additional capital provides the opportunity for growth in the Bank’s loan portfolio as well as investments in fixed assets, including new headquarters to accommodate further growth and modernisation of the bank. 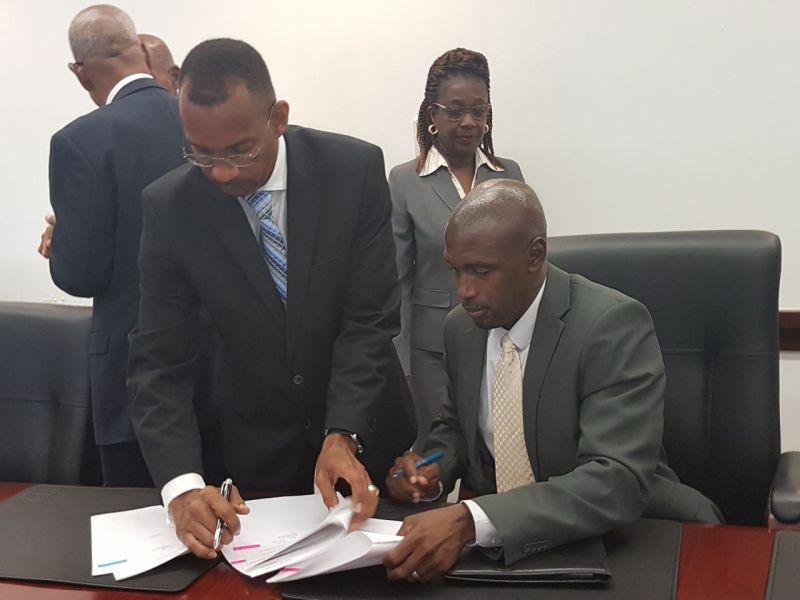 "This will no doubt allow the bank to offer new services and assist our National Bank in strategically competing with other financial institutions in the Virgin Islands to the benefit of our society," Dr Smith stated. It is the first time the SSB has invested in such a way in a bank in the Virgin Islands. Vino you are so late. That $15 mil was used long time to bailout the bank. Even before it was approved in the house of assembly. This is just formality. Now we have to watch how SSB using people money. This should never happened. Investing in a bankrupt bank with tax payers money. This government gays to go Zimbabwe. We no need corruption here. Great move to ensure survival of nbvi and funds to people who need it and returns to pensioners. That's Less than 4% of ssb investments for the info of the idiot bloggers and talk show hosts sitting on the edge of their seats. Sad commentary from people who claim they love BVI and anything BVI! We should be very proud of this moment especially with the foreign banks messing our people around after the recent Hurricanes. Blah blah blah just another bad deal like BVI Airways. Nothing to be proud of here. SSB is just a bailout fool. Even a brainless jackass can see what worthless mistake this will be for tax payers. Get your damn head out the sand. So how many times can the NDP Government dip in the SSB kitty? They don't need to dip anymore. SSB has assumed 33% of nbvi debt on your back. The biggest mistake of a finance minister ever. This is a good move in my opinion but sadly, the National Bank of the Virgin Islands does very little to help the people of the Virgin Islands. They are more rigid than the foreign banks if you ask me. That was my bank keep my savings their. I work for a good salary went to get a lone they turn me down.. Everytime I check they will call me until i get fed up. So i sent my living Girlfriend to try for the loan it was a personal loan a small, at that time She works for $5.50 an hour with no savings at the bank. With in a week she get the loan. I just went and take off all my money and close mu account without saying a word...I paid the loan my girlfriend got because she got it for me and it was paid off before the time... Their failure is their behaviour...Locals hatimg locals. My girlfrind was from Dominica and she wad on permit, I think the loan officet was making a move on her, she just play the game to get the money...Foolish people..
Is the NBVI healthy? Is it solvent? Is this a safe and strong investment for Social Security or it is just nationalism and reinvesting in the local community? How does NBVI performance rank among relative to other banks operating in the VI? If $15M equals 1/3 (33%) ownership, then the bank assets are only valued $45M? How much control will SS have over the bank operations? Was this the best of use of SS contributors money? To answer your questions. No it's not a healthy bank. It's not a safe investment for SSB. It's not the best use of SSB money. One thing is certain all tax payers will be paying the consequence down the line. Keep a close eye on SSB. They bought shares that no one right in their mind would buy. If the bank is unhealthy, not a safe investment, not the best use of SSB $$$$$$.........etc, then how did this action occur and who approved it? What change from the recent FSC findings? Is this just local politics? Does the SSB not set policy and Director carry them out? So the SSB has responsibility and accountability for this questionable investment of fund? Is this effective stewardship of SS $$$$$$. True, SS cannot meet its obligations of paying retirement, paying the disable, supplementing the elderly.......etc mainly from workers contributions; it has to make sound investment on medium to low risks products? Is investing in the NBVI a high risk investment? What is the projected return on this investment? What is the timeline for recouping the $15M investment? What % is the $15M of the SS investment portfolio? If NBVI collapses, who has first take at assets, ie, government or other owners? Were the taxpayers consulted? The ones who have diligently paid into this fund so they will have a pension. This is not why I pay into the fund. I pay into it so when I am old I am guaranteed a pension. It is not a slush fund for mistakes. Is this fund constitutionally protected? Very good comment excellent points. What about the payments since the hurricanes that seniors have not been paid? No payment in September, October 3 was paid for October, November 1 was paid for November And here comes Christmas and not a word if a double payment will be made this month for September and December. Pay who has paid in and who you owe first. Does this mean john public can buy shares in the bank? or is this a merge? What a thing keep investing our money we want our percentage to. Don't hold back on poor people money like some statuary bodies. Everything that man touch around here failed. He was encouraging people to invest in the port, With all the shower coat yet it fails. He had a lot of knowledge and is a damxxn good talker. But He has no respect and regards for people and peopple's money...Hope people start getting their dividence fr thrir port investment as promised.. The management have no respect for staff!!! Shameful this is how we had to find out!!! Like everybody else!!! Smh! I feel your pain colleagues. Some just there because they need work. If John public only knew. Well we just got paid a retirement check for December but none for September when nothing was paid. Yes money went to the bank for October 3rd but that was the only payment that month. Nov 1st a payment went to the bank and that was for november. December 20th a payment was made but SEPTEMBER IS STIILL NOT PAID! Good move. Let us send message to some of the non-local banks who cutting style on locals to give them a loan. An investment in our people is an investment well worth it.